Sierra Nevada forests, already weakened in many areas by overcrowded conditions, have lost their ability to repulse insect attacks due to several years of severe drought. 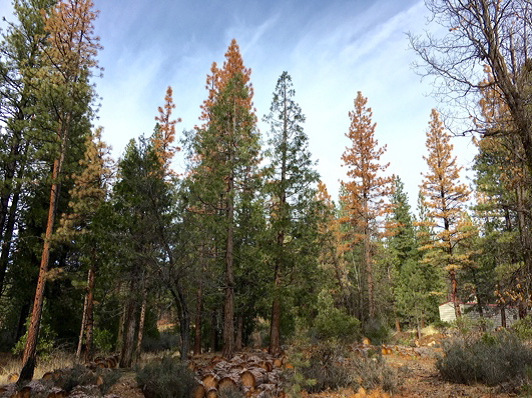 Residents and agencies in areas of the Southern & Central Sierra Nevada are currently addressing how to deal with 102 million trees that have died since 2010. 65 million of these have been identified in 2015 and 2016 alone. Plumas County has the opportunity to work strategically to address tree mortality here before it reaches crisis levels. The Plumas County Tree Mortality Task Force is a collaborative group of agency, industry, and individual stakeholder volunteers brought together by the Plumas County Fire Safe Council and the Plumas County Office of Emergency Services. Do you need help identifying tree mortality or developing a plan of action locally? Looking for tree removal assistance? Registered professional Foresters, licensed timber operators that assist with tree removal in Plumas County. Contractors that have expressed interest in bidding on Plumas Firesafe Council Projects. Do you require financial and planning assistance for tree removal on your property? Would your community benefit from grant funding for tree removal on multiple parcels?